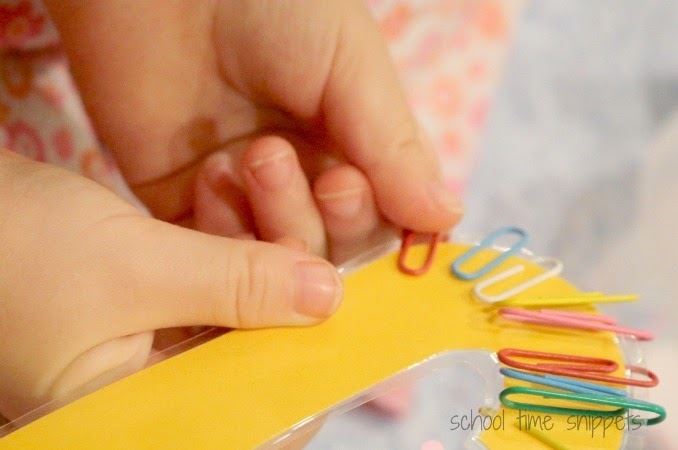 I picked up a colorful pack of paperclips from the Dollar Store a few days ago and came home and made this easy fine motor activity for my kids. Not only is this great for fine motor skills, but this Paperclip Candy Cane activity also encourages color matching, counting, patterns, or is just great for free-play. With the package of paperclips, I set up an invitation to create candy cane stripes! 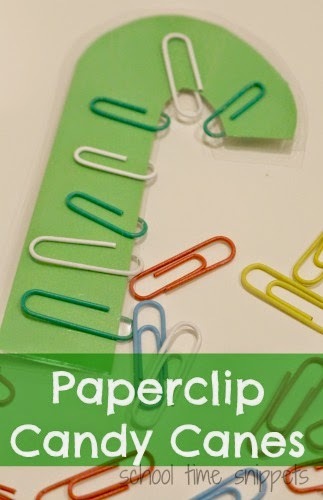 As mentioned above, this could be used to reinforce color matching skills, so I cut out candy canes from construction paper with the colors of the paperclips in mind-- yellow, red, pink, green, blue, and white. To keep the paper candy canes from being ripped during use, I laminated them for durability with my most favorite school room tool... my Scotch Laminator! 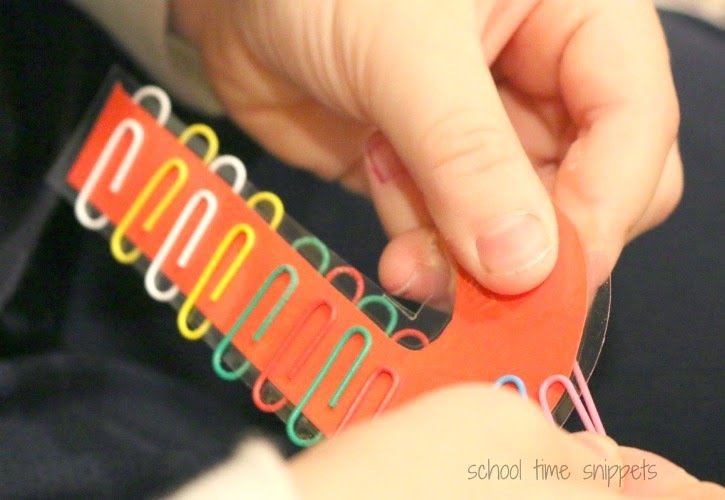 I placed the laminated candy canes and paperclips in a tray and this activity didn't have to wait long to be played with; Big Brother grabbed it first and enjoyed making all sorts of different colorful candy cane striped patterns. There was no method to Little Sis's candy cane stripes, but this proved to be a great way to work on her fine motor skills! Even Baby Brother, who just turned 2, put on a few paperclip stripes with my help! 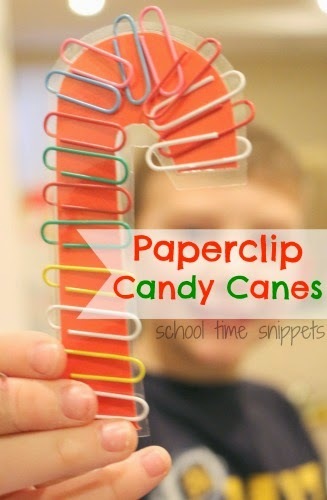 Our Paperclip Candy Canes activity will definitely be left out on the shelf for the next week or two! Love that it was simple to make and put together.... and that there are many ways to sneak in learning concepts with this activity! 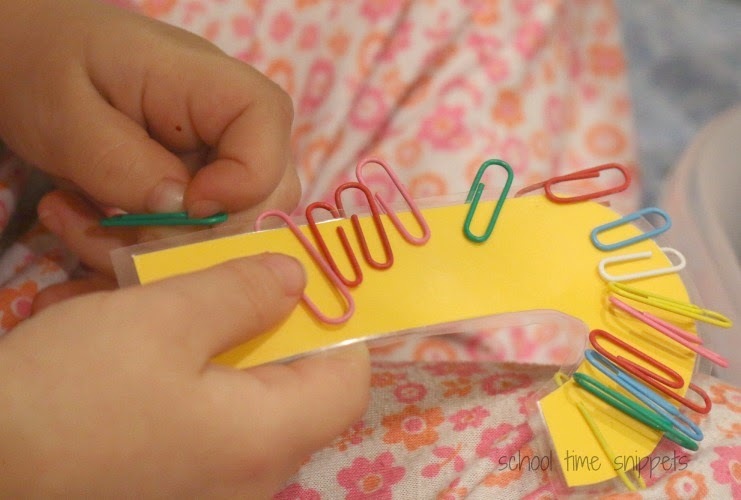 Check out more fine motor activities from my lovely Fine Motor Fridays co-hosts! 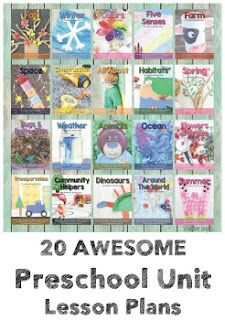 Need more fine motor ideas at your fingertips, check out our book!